These Dunvegan Marriages listed below are now part of Gravestones of Glengarry Vol.12, Dunvegan. These Dunvegan Marriages listed below are now part of Gravestones of Glengarry Vol.12, Dunvegan and names are listed in the combined index. By The Rev. Adam McQueen - minister. Alexander Grant, Age 28 yrs., Residence Kenyon, Place of birth, Kenyon. Parents:- Alexander Grant and Mary Fraser. Flora McMaster, age 21 yrs. ; Residence Kenyon; Place of birth, Kenyon. Parents:- Angus McMaster and Ann McDonald. Married - June 22, 1857, witness John McMaster, Kenyon. Mary Bethune, Age 27 years, Residence Kenyon; Place of birth Kenyon. Parents - Donald Bethune and Catherine McLeod. John Dashney Age 28 years; Residence Hawkesbury; Place of birth Lochiel . Parents - Louis Dashney and Peggy McDonald . Isabella McLeod , age 27 years ,Residence Caledonia ; Place of birth ,Scotland. Parents - Norman McLeod and Marion Dewar. Donald Fisher , age 28 years; Residence Lochiel ;Place of birth, Lochiel. Parents - Duncan Cameron and Catherine McDonald. Married Nov. 25, 1859. Witness Jas. R. McKenzie, Kenyon. Hector McLean, age 32 years, Residence Kenyon; Place of birth, Isle of Skye. Parents - Lachlan McLean and Isabella McDonald. Margaret McMillan, age 25 years; Residence Kenyon; Place of birth, Lochiel. Married - Feb. 9, 1860. Witness - John McRae, Kenyon. Malcolm McLean, age 31 years; Residence Kenyon; Place of birth, Isle of Skye. Parents - Neil McLean and Catherine McLeod. Mary McCrimmon, age 29 years; Residence Kenyon; Place of birth, Caledonia. Parents - Duncan McCrimmon and Ann McLeod. Married April 10,1860. Witness - John McCrimmon, Kenyon, Ont. Paul McMaster, age 26 years; Residence Kenyon; Place of birth, Kenyon. Parents - Angus McMaster and Ann McDonald. Isabella Grant, age 20 years; Residence Kenyon; Place of birth, Kenyon. Parents- Alex Grant and Mary Fraser. Married June 26,1860. Witness Neil McLeod, Kenyon. Donald Campbell, Age 23 years; Residence Kenyon; Place of birth, Scotland . Parents - Ewen Campbell and Flora Campbell. Mary Urquhart, age 22 years; Residence Kenyon, Place of birth ,Kenyon. Parents - David Urquhart and Christy McGillivray. Married Mar. 13, 1861. Witness Alexander McRae, Kenyon. John Morrison, age 26 years; Residence Kenyon; Place of birth Canada East. Mary Cameron, Age 18 years; Residence Kenyon; Place of birth, Kenyon. Parents - John Cameron and Ann McDonald. Married June 3,1861. Witness John H. Morrison, Newton. Ewen McLean age 24 years; Residence Kenyon; Place of birth, Scotland. Ann McRae, age 19 years; Residence Kenyon; Place of birth, Kenyon. Parents - John McRae and Catherine Munro . Married Aug. 20, 1861. Witness Donald McPhee, Kenyon. Eliza McLean, age 19 years; Residence Winslow Place of birth, Scotland. Parents - Ewen McLean and Emily Morrison. Married Mar. 20, 1862. Witness, Breadalbane McLean. David Dewar age 31 years; Residence Roxboro; Place of birth, Kenyon. Parents- Ewen Dewar and Christy McLeod. Mary Campbell, age 23 years; Residence Kenyon; Place of birth, Kenyon. Parents - Angus Campbell and Mary McInnes. Married Apr. 14, 1862. Witness John Urquhart, Dunvegan. Angus McLean, age 28 years; Residence, Roxboro ;Place of birth, Scotland. Parents - John McLean and Catherine McLeod. Mary Stewart, age 23 years; Residence, Kenyon; Place of birth, Kenyon. Parents - Ales Stewart and Mary Stewart. Married - May 6, 1862. Witness Angus McLean, Kenyon. Duncan Campbell, age 31 years ; Residence Kenyon, Place of birth, Kenyon. Parents - Malcolm Campbell and Peggy McDonald. Margaret Campbell, age 26 years; Residence Kenyon; Place of birth, Scotland. Parents - John Campbell and Janet McLeod. Married July 30, 1862. Witness - Norman Campbell, Roxboro. John Fraser, age 34 years; Residence Kenyon; Place of birth Kenyon. Parents - John Fraser and Christy Cameron. Catherine McRae, age 27 years; Residence Kenyon; Place of birth, Kenyon. Parents - Kenneth McRae and Margaret Campbell . Married Aug. 12, 1862 - Witness Ewen McMillan, Kenyon. Charles Stewart, age 28 years; Residence, Kenyon; Place of birth, Kenyon. Parents - Alex Stewart and Mary Stewart. Isabella McCuaig, age 18 years Residence Caledonia; Place of birth, Caledonia. Parents - John McCuaig and Ann McSweyn. Married Oct. 4, 1862 .- Witness - John McCuaig, Caledonia. John McCuaig, age 29 years; Place of residence, Kenyon; Place of birth, Kenyon. Parents - John McCuaig and Mary McLeod. Isabella McLeod, age 24 years Residence Kenyon, Place of birth ,Kenyon. Parents - John McLeod and Flora Campbell. Married - Oct.7, 1862. Witness Alexander McCrimmon, Kenyon. Settlement. Parents - John Matheson and Ann Polson. Victoria Johnstone, age 24 years; Residence Roxborough, Place of birth Roxboro. Parents - Wm. Johnstone and Mary Crone. Married Nov. 12, 1862. Witnesses - Richard Marshall and Sarah McIntyre. Donald McDonald ,age 25 years; Residence, Plantagenet; Place of birth, Plantagenet. Parents - Donald McDonald and Mary Cameron. Mary McRae, age 24 years; Residence Kenyon; Place of birth, Kenyon. Parents - Kenneth McRae and Margaret Campbell. Married Nov. 20, 1862. Witness John McRae, Kenyon. Hector McDougal, Age 27 years; Residence Finch; Place of birth, Scotland. Parents - Alex McDougal and Flora Patterson. Mary McDermid, age 26 years; Residence Finch; Place of birth, Finch. Married June 23, 1863. Witness , Ewen McLean, Finch. Duncan McLauren, age 29 years; Residence Kenyon; Place of birth, Breadalbane. Parents - John McLauren and Christy McLauren. Janet McGregor, age 25 years; Residence Kenyon; Place of birth, Kenyon. Parents - Malcolm McGregor and Janet McDougall . Married - Mar. 12, 1863. Witness D. P. Campbell H. A., Athol. Donald Campbell , Age 21 year- ; Residence Kenyon, Place of birth, Kenyon. Parents - Alex Campbell and Ann McRae. Isabella McRae, Age 21 years; Residence Kenyon; Place of birth Hawkesbury. Parents Alex McRae and Christy Morrison. Married Mar. 17, 1863. Witness John Campbell, Kenyon. Parents - John Urquhart and Ann McGillivray. Ann Urquhart, age 20 years; Residence , Kenyon, Place of birth, Kenyon. Parents - Kenneth Urquhart and Betsy Leonard. Married - Aug. 3, 1863. Witness, John Urquhart, Kenyon. John McCuaig, age 25 years; Residence, Caledonia; Place of birth, Caledonia. Euphemia Stewart, age 22 years; Residence Kenyon, Place of birth, Kenyon. Parents - Alexander Stewart and Mary Stewart. Married- Aug. 11, 1863. Witness, Peter McSweyn, Kenyon. Kenneth McLeod, age 32 years; Residence Kenyon; Place of birth, Scotland. Rebecca McLeod, age 25 years; Residence Kenyon; Place of birth, Kenyon. Parents - Norman McLeod and Christy McRae. Married Aug. 11, 1863. Witness - Malcolm Dewar, Dunvegan. Alex Stewart, age 27 years; Residence Kenyon; Place of birth, Kenyon. Parents - Alexander Stewart and Mary Stewart. Isabella McRae, age 23 years; Residence Kenyon; Place of birth, Kenyon. Parents - Murdoch McRae and Mary McDonald. Married Aug. 13, 1863. Witness Donald McRae, Kenyon. John McRae, age 28 years; Residence Kenyon; Place of birth, Kenyon. Mary McLeod, age 22 years; Residence Kenyon; Place of birth, Kenyon. Parents - Norman McLeod and Mary McLeod. Married - Aug. 20, 1863. Witness - Donald Cameron. Kenyon. Neil R. McLeod, age 27 years; Residence Kenyon; Place of birth, Kenyon. Parents - Donald McLeod and Isabella Murray. Marion Stirling, age 26 years; Residence, Hawkesbury; Place of birth, Hawkesbury. Parents - Archibald Stirling and Catherine Shaw. Married - Nov. 19, 1863. Witness - Wm. McLeod, Charlottenburg. Norman Campbell, age 31 years; Residence, Kenyon; Place of birth, Kenyon. Parents - John Campbell and Christy Nicholson. Mary Campbell, age 21 years; Residence Kenyon; Place of birth, Kenyon. Parents - Alexander Campbell and Ann McRae. Married Dec. 10, 1863. Witness- John Campbell , Kenyon. William McRae, age 41 years; Residence Finch; Place of birth, Scotland. Parents - John McRae and Isabella McRae. Mary McRae, age 20 years; Residence Caledonia; Place of birth, Caledonia. Parents - Donald McRae and Betsy McCrimmon. Married Feb. 17, 1864. Witness - Malcolm McRae, Caledonia. Margaret McRae, age 17 years ; Residence, Kenyon; Place of birth, Kenyon. Married - July 26, 1864. Witness - Alex McRae. Kenyon. Donald McLean, age 28 years; Residence Kenyon; Place of birth, Isle of Skye. Flora Nicholson, age 19 years; Residence Kenyon; Place of birth, Isle of Skye. Parents - Donald Nicholson and Ann McLeod. Married Sept. 1, 1864. Witness Alex McRae, Kenyon. Duncan McCuaig, age 28 years; Residence Caledonia, Place of birth, Caledonia. Parents - John McCuaig and Ann McSweyn . Parents - Donald McNaughton and Ann Ferguson. Married - Oct. 18, 1864. Witness - Alexander McCrimmon, Kenyon. Donald McRae, age 23 years; Residence Kenyon, Place of birth, Kenyon. Parents - Malcolm McRae and Ann Morrison. Mary McRae, age 19 years; Residence Lochiel; Place of birth Lochiel. Parents - Malcolm McRae and Ann Dewar. Married Mar. 17, 1865. Witness John McRae, Lochiel. Roderick McLennan, age 23 years; Residence Roxborough; Place of birth Lochiel. Parents - Finlay McLennan and Mary McIntosh . Sarah McRae, Age 20 years; Residence Caledonia ; Place of birth, Caledonia. Married - July 5, 1865. Witness John McLennan, Lochiel. Duncan McGillivray, age 27 years; Residence Hawkesbury; Place of birth Hawkesbury. Parents - Angus McGillivray and Sarah McRae. Mary McIntyre, age 21 years ; Residence Kenyon, Indian Lands; Place of birth, Kenyon, Indian Lands. Parents - Donald McIntyre and Christy McCrimmon. Married July 11,1865. Witness - John McGillivray, Hawkesbury. Parents - John McGillivray and Ann McLennan. Scotland. Flora Cameron, Age 30 years; Residence Kenyon; Place of birth, Scotland. Parents - Donald Cameron and Catherine McLennan. Married - Feb. 28, 1866. Witness - - Farquhar Dewar, Kenyon. Donald Chisholm, Age 32 years; Residence Winford; Place of birth ,Scotland. Sarah McCuaig, age 29 yearn; Residence Kenyon; Place of birth, Scotland. Parents - Neil McCuaig and Marion Robertson. Married - Mar. 9, 1866. Witness - Alexander McLeod, Kenyon. Alex Cameron, Age 26 years; Residence, Lochaber; Place of birth, Lochaber. Parents Charles Cameron and Catherine Cameron. Ann Stewart, age 20 years; Residence Kenyon; Place of birth, Kenyon. Married Mar. 14, 1866. Witness - Wm. McRae, Kenyon. Malcolm McSweyn ,Age 23 years; Residence, Kenyon; Place of birth, Kenyon. Parents - Finlay McSweyn and Ann McCuaig. Flora McMillan, Age 24 years; Residence ,Kenyon; Place of birth, Kenyon. Parents John McMillan and Christy McMillan. Married - Mar. 13, 1866. Witness - Finlay McLennan, Lochiel. Malcolm Morrison, Age 45 years; Residence Roxboro; Place of birth, Kenyon. Parents - Donald Morrison and Margaret Campbell. Margaret Campbell, Age 29 years; Residence, Kenyon, Place of birth, Kenyon. Married Apr. 17, 1866. Witness - John McLennan , Dunvegan. Donald Cameron, Age 32 years; Residence Kenyon; Place of birth, Kenyon. Harriet McDonald, Age __ Residence Caledonia; Place of birth, Caledonia. Parents - Norman McDonald and Mary McLeod. Married July 11, 1866. Witness - Donald McPhee, Dunvegan. Donald McKenzie, Age 23 years; Residence Roxborough; Place of birth, Scotland. Parents - John McKenzie and Isabella McKenzie. Jannet McGregor, Age 25 years ; Residence Kenyon; Place of birth, Roxborough. Parents - Donald McGregor and Elizabeth McGregor. Married Sept. 14, 1866. Witness, Duncan McDermid, Roxborough. Malcolm Aird, Age 23 years; Residence ,Roxborough; Place of birth, Roxborough. Parents - Alex Aird and Nary Morrison. Janet Lea Cameron, Age 19 years; Residence Roxborough, Place of birth, Roxborough. Parents - Angus Cameron and Euphemia Begg. Married - Sept. 24, 1866. Witness Peter Fisher Athol. John McCuaig, Age 35 years ;Residence Caledonia ; Place of birth, Newton L. C.
Parents - Donald McCuaig and Ann McLennan. Parents - Malcolm Morrison and Peggy McCaskill. Married - Oct. 8, 1866. Witness - Norman Bethune, Kenyon. Murdoch McNeil, Age 28 years ; Residence Roxborough ; Place of birth, Scotland. Parents - Donald McNeil and Catherine Cameron. Ann Stewart, Age 19 years ; Residence Kenyon ; Place of birth, Kenyon. Parents - Peter Stewart and Ann McRae. Married - Feb. 28, 1867. Witness - Finlay McNeil, Roxborough. Duncan McLennan, Age 32 ; Residence, Lochiel ; Place of birth, Lochiel. Parents - Duncan McLennan and Isabella McRae . Jessie Stewart, Age 22 years; Residence, Kenyon ; Place of birth, Kenyon. Married - Mar. 19, 1867. Witness, John Campbell, Kenyon. John Stewart, Age 50 years ; Residence Kenyon ; Place of birth, Scotland. Parents - Donald Stewart and Janet Nicholson. Effy McFarlane, Age 30 years; Residence Kenyon ; Place of birth, Scotland. Married Oct . 2, 1867 . Witness ,John McLennan, Kenyon. John McLeod, Age 28 years ; Residence Caledonia; Place of birth, Caledonia. Parents - Norman McLeod and Marion McLeod. Rachel McDonald Age 24 yrs., Residence Caledonia, Place of birth, Caledonia. Married - June 24, 1868. Witness - Donald McLeod, Caledonia. Farquhar McCrimmon Age 32 years; - Residence Lochiel; Place of birth, Scotland. Parents - Donald McCrimmon and Ann Campbell. Parents - Finlay McLennan and Ann McLennan. Married - July 6, 1868. Witness Allan McCrimmon , Kenyon. Malcolm McLean, Age 26 years, Residence, Oshawa ; Place of birth, Scotland. Parents - Allan McLean and Jane McLean. Margaret A. Cattanach, Age 21 years; Residence Kenyon, Place of birth, Kenyon . Parents - Donald Cattanach and Flora McKenzie. Married - Jan. 5, 1869 .Witness - Alex Cattanach - Toronto. Alexander McRae, Age 27 years ; Residence Kenyon; Place of birth, Kenyon. Jane Dey, Age 26 years; Residence Kenyon; Place of birth, Lower Canada. Parents - Thomas Dey and Helen Farquhar. Married Jan. 12, 1869 Witness, Norman Murray, Kenyon. Alexander McDonald, Age 33 years; Residence Kenyon; Place of birth, Scotland. Parents - Alexander McDonald and Catherine McRae. Christy Stewart, Age 19 years; Residence Kenyon; Place of birth' Kenyon. Married Feb. 23, 1869. Witness, Kenneth Campbell. Angus Gray Age 36 yrs. ; Residence Kenyon ; Place of birth, Kenyon. Parents - Donald Gray and Ann McCrimmon. Isabella Cameron Age 26 years; Residence Kenyon; Place of birth, Kenyon. Married Dec. 30, 1869. Witness Roderick Cameron, Kenyon. Kenneth Fletcher, age 25 years; Residence Kenyon; Place of birth, Kenyon. Parents, Duncan Fletcher and Margaret McLeod. Sarah Campbell, age 29 years; Residence Kenyon; Place of Birth, Kenyon. Parents Angus Campbell and Mary McInnes. Married May 19, 1870. Witness Donald McMillan, Lochiel. Malcolm McLachlan, age 34 years; Residence Lochaber; Place of birth, Lochiel. Parents Robert McLachlan and Mary McDonald. Sarah Campbell, age 23 years; Residence Lochiel; Place of birth, Lochaber. Parents Donald Campbell and Sarah Campbell. Married June 14, 1870. Witness, Robert McLachlan. Norman McRae, age 27 years; Residence Kenyon; Place of birth, Kenyon. Parents Murdo McRae and Mary McDonald. Mary Ann McKenzie, age 19 years; Residence Kenyon; Place of birth, Kenyon. Parents Jas. McKenzie and Ann McLauren. Parents Arch. McKillop and Peggy McRae. Christy McDonald, age 25 years; Residence Finch; Place of birth, Finch. Parents ________ McInnes and Ann McInnes. Married Sept. 21, 1870. Witness Hugh McMillan, Finch. Lachlan Campbell, age 20, Residence Roxborough, Place of birth, Roxborough. Parents Finlay Campbell and Mary McDonald. Anna McKenzie, Age 19 years; Residence Kenyon; Place of birth, Kenyon. Parents Jas. McKenzie and Gormul Gilles. Married July 6, 1870. Witness Malcolm Campbell, Roxborough. Wm. Clark, age 33 years; Residence Kenyon; Place of birth Lochiel. Parents Duncan Clark and Margaret McPherson. Katherine McMillan, age 33 years; Residence Kenyon; Place of birth, Kenyon. Parents M. McMillan and Christena Campbell. Married Oct. 26, 1870. Witness Donald McMillan, Kenyon. Parents James McMillan and Mary McKay. Lilly McLeod, Age 24 years ; Residence, Lochiel, Place of birth, Lochiel. Parents - Alexander McLeod and Catherine Fraser. Married Feb. 2, 1871. Witness - Hugh McLeod, Lochiel. Farquhar McRae, Age 32 years ; Residence Kenyon ; Place of birth, Scotland. Parents - John McRae and Christy McCrimmon . Catherine Stewart, Age 23 years ; Residence Kenyon ; Place of birth, Kenyon. Parents - Norman Stewart and Annie McKercher. Married - Mar. 14, 1871. Witness - Malcolm McRae, Kenyon. Parents We. McLeod and Christy Grant. Catherine Morrison Age 23 years; Residence, Kenyon, Place of birth, Kenyon. Parents - John Morrison and Flora McDonald. Harried Apr. 13, 1871. Witness - John Campbell , Kenyon. Parents - Alex McRae and Christy Morrison. Sarah Campbell, Age 21 years; Residence Kenyon; Place of birth, Kenyon. Parents - Ranald Campbell and Jessie McRae. Married June 20, 1871, Witness, Angus Campbell Kenyon. Thomas Campbell, Age 24 years; Residence Kenyon; Place of birth, Kenyon. Parents Ranald Campbell and Jessie McRae. Jane Ferguson, Age 17 years; Residence Kenyon; Place of birth, Kenyon. Parents - Donald Ferguson and Margaret McGregor. Married July 10. 1871 . Witness - Kenneth Campbell, Kenyon. Alex McLeod, Age ___ years; Residence Lochiel; Place of birth, Lochiel. Parents - Donald McLeod and Isabella Forbes. Margaret McIntyre, Age 21 years; Residence Kenyon; Place of birth, Kenyon. Parents - Donald McIntyre and Betsy McCrimmon. Married - Aug. 1, 1871. Witness - Neil McLeod, Lochiel. Donald McLeod, Age 28 years; Residence Caledonia; Place of birth, Caledonia. Parents _ Norman McLeod and Marion Dewar. Parents , Neil Dashney and Marion Morrison. Married Aug. 29, 1871. Witness - Donald McLeod, Caledonia. Angus Cameron, Age 24 years; Residence Kenyon; Place of birth, Kenyon. Mary Jane Liddle, Age 22 years ; Residence Kenyon, Place of birth, Kenyon. Parents ; William Liddle and Eliza McEwen . Married Sept. 12, 1871 ; Witness - Malcolm Cameron, Kenyon. John A. Fisher, Age 30 years, Residence ; Kenyon ; Place of birth, Kenyon. Parents - Alex Fisher and Janet McNaughton. Margaret Munro Age 27, Residence Caledonia ; Place of birth, Caledonia. Parents - Hugh Munro and Mary Ann Gilchrist. Married , Nov. 6, 1871. Witness - Gilbert Munro, Caledonia . Donald McLeod , Age 34, Residence , Caledonia ; Place of birth ,Caledonia. Parents - Rory McLeod and Catherine McCuaig. Mary McDonald, Age 30 years , Residence, Caledonia ; Place of birth, Cal. Married Nov. 28, 1871 ; Witness - Alexander McLeod, Kenyon. Angus Campbell, Age 40 years ; Residence ,Roxboro; Place of birth, Roxboro. Parents - Finlay Campbell and Harriet McKay. Married Jan. 23, 1872. Witness - Arc'd Campbell, Roxborough . Roderick Cameron, Age 40 years ; Residence Kenyon ; Place of birth - Kenyon. Ann McCrimmon, Age 23 years ; Residence, Kenyon ;Place of birth, Scotland. Parents - Norman McCrimmon and Ann McCrimmon. Peter McLeod, age 23 years ; Residence, Kenyon ; Place of birth, Kenyon. Parents - Roderick McLeod and Marion McCuaig. Margaret McDonald, Age 20 years ; Residence, Kenyon ; Place of birth, Kenyon. Parents - Donald McDonald and Marion McCrimmon. Married Au. 9. 1872. Witness, John Stewart , Kenyon. Donald McDonald, age 26 years; Residence, Windsor; Place of Birth, Kenyon. Parents - John McDonald and Mary McInnes. Isabella Urquhart, Age 25 years ; Residence, Kenyon, Place of birth, Kenyon. Married - Sept. 17, 1872. Witness - Wm. Urquhart, Kenyon. Alex McLean, Age 32 years; Residence ______ ; Place of birth, Scotland. Mary Grant, Age, 26 years ; Residence Roxboro; Place of birth, Roxboro. Parents - Donald Grant and Althea McKillican. John Stewart, Age 29 years; Residence Kenyon ; Place of birth, Kenyon. Parents - Alex Stewart and Christy McFarlane. Flora McRae, Age 19 years; Residence, Kenyon; Place of birth, Kenyon. Parents Kenneth McRae and Margaret Campbell. Married - Aug. 9, 1872. Witness John Stewart, Kenyon. Parents - Alex. McKenzie and Ann Murray. Sarah McRae, Age 22 years ; Residence Kenyon; Place of birth, Kenyon. Parents - Kenneth McRae and Maggie Campbell. Donald Davidson, Age 32 years ; Residence Roxboro; Place of birth, Roxboro. Parents - John Davidson and Isabella Sproule. Ellen Dey, Age 32 years; Residence, Kenyon; Place of birth, Lachute. Parents - Thomas Dey and Ellen Farquhar. Married - Jan 1, 1873. Witness, George Dey, Dunvegan. Parents - M. McKay and Christy McDonald. Mary Ann McKercher, Age 19 years; Residence, Caledonia; Place of birth, Cal. Robert McLaurin, Age 31 years ; Residence Roxboro, Place of birth , Roxboro. Maggie McDougal, Age 25 years; Residence Lochiel ; Place of birth, Lochiel. Parents - Dougald McDougald and Christy Campbell. Married - July 17, 1873. Witness, P. A. McLaurin, Roxboro. Arthur Wellington Ross, Age 27 years; Residence, Kenyon; Place of birth, Ontario. Jessie Cattanach, Age 27 years; Residence Kenyon; Place of birth, Kenyon. Parents - Donald Cattanach and Flora H McKenzie. Married - July 31, 1873. Witness - John B. Cattanach, Dalhousie. Norman McCrimmon, Age 30 years ; Residence Lochiel ; Place of birth, Canada. Parents - John McCrimmon and Catherine McGillivray. Normanda McDonald Age 26 years; Residence Lochiel; Place of birth, Canada. Parents - Neil McDonald and Janet McLeod. Married - Oct. 27, 1877. Witness - Wm. Urquhart, Dunvegan. John Dickson, Age 26 years ; Residence Dunvegan; Place of birth, Scotland. Flora McDonald, Age 27 years; Residence Caledonia, Place of birth, Canada. Married - Dec. 27, 1877. Witness - Neil McLeod Caledonia. Alexander Campbell, Age 25 years; Residence, Kenyon; Place of birth Kenyon. Parents - Alexander Campbell and M. McRae. Marion Chisholm, Age; Residence Kenyon; Place of birth, Canada. Parents - Donald Chisholm and Catherine Tolmie. Married July 11, 1878. Witnesses - Donald, Ranald and Alex Campbell, Dunvegan. Donald O. McLeod , Age 33 years. Residence, Dunvegan; Place of birth, Dunvegan. Parents - Olaus McLeod and C. McIntosh. Parents Alexander McCaskill and ____ McRae. Married July 19, 1878. Witnesses - Donald McIntosh and Rev. ___ McRae, Hawkesbury. Parents - Donald McLeod and Margaret McRae. Mary Ann Campbell, Age -- Residence Kenyon ; Place of birth, Canada. Parents - John Campbell and Mary McGregor. Married - July 31, 1878. Witnesses - Alexander Urquhart and Angus McLeod, Kenyon. Parents - Donald McIntosh and Mary Morrison. Mary McDonald Age 29 years; Residence Kenyon; Place of birth, Canada. Parents - Donald McDonald and Flora Urquhart. Married - Sept. 11, 1878. Witnesses - William Urquhart, Dunvegan. Archibald Gray, Age 24 years ; Residence Kenyon; Place of birth, Canada. Parents John Gray and Harriet McKinnon. Flora McRanald, Age 25 years ;Residence Kenyon , Place of birth ,Scotland. Parents - Duncan McRanald and Mary Nicholson. John McRae, Age 40, Residence E. Hawkesbury, Place of birth, Canada. Parents - Alex McRae and Flora McCuaig. Catherine McRae , Age 21 years; Residence, Kenyon ; Place of birth, Canada. Parents - Kenneth McRae and Catherine McRae. Married - Dec. 11, 1878. Witness - Malcolm Dewar, Kenyon. Malcolm McRae, Age 23 years ; Residence West Hawkesbury; Place of birth, Canada. Parents - Arc'd McRae and Catherine McRae. Ann Stewart, Age 23 years ; Residence, Kenyon; Place of birth, Canada. Parents - Lachlan Stewart and Catherine McRae. Married Apr. 22, 1879. Witnesses - Malcolm McRae and Donald McRae, Kenyon. Murdoch McRae, Age 25 years; Residence , Roxboro ; Place of birth, Canada. Parents - Alex McRae and Catherine Finlayson. Isabella McRae, Age 24 years; Residence , Kenyon; Place of birth, Canada. Parents - Malcolm McRae and Catherine McRae. Married - Oct. 9, 1879. Witnesses - Daniel McKillican, Roxboro, John McRae, Kenyon. Donald McCuaig, Age 48 years ; Residence Kenyon ; Place of birth, Canada. Parents - Donald McCuaig and Sarah Dewar. Parents - Donald McCuaig and Margaret Campbell. Canada. Parents - Kenneth McLennan and Mary McLeod. Mary Ann Fraser, Age 21 years ; Residence Kenyon ; Place of birth, Canada. Parents - William Fraser and Mary McLennan. Married 20th Oct. ,1880. Witnesses - Malcolm Dewar and Donald McDonald, Kenyon. Gregor McDonald, Age 29, Residence Kenyon ; Place of birth, Canada. Parents - Donald McDonald and Catherine McGregor. Mary McNaughton, Age 23 years ; Residence Kenyon ; Place of birth, Ireland. Parents - Wm. McNaughton and Hannah Moore. Married - Oct. 26, 1880. Witness - Lizzie McGregor. Alexander Lhird? ? , age 37 years; Residence Huntington, Que., Place of birth, Scotland . Parents - Lhird. William and Elspit McKenzie. Mary McLeod, Age 26 years ; Residence Kenyon; Place of birth Canada. Parents - John McLeod and Catherine McCuaig. Thomas McGowan, Age 55 years, Residence, Kenyon; Place of birth, Canada. Parents - James McGowan and Catherine McLay?. Sarah McCrimmon, Age 40 years; Residence, Kenyon; Place of birth, Canada. Parents Duncan McCrimmon and Ann McLeod. Married Sept. 26, 1881. Witnesses - Duncan McLeod and Jessie McLeod, Kenyon. John Arch 'd McLeod, Age 31 years; Residence Caledonia; Place of birth, Canada. Parents - Arch'd McLeod and Christena McIntosh. Marcella McLeod, Age 21, Residence Caledonia ; Place of birth, Canada. Parents - Neil B. McLeod and Christena McCrimmon. Married Sept. 27, 1881. Witnesses - Wm. D. McLeod and John McCrimmon, Caledonia. Hugh McMillan, Age 36 years; Residence Kenyon; Place of birth, Canada. Parents - Duncan McMillan and Christens Dewar. Jane Fraser, Age 36 years; Residence Kenyon; Place of birth, Canada. Parents - Donald Fraser and Isabella Munro. Harried Oct. 12, 1881. Witnesses - Wm. Dewar, Lochiel and Hugh McMillan, Kenyon. Roderick Fraser, Age 24 years; Residence Kenyon; Place of birth, Caledonia. Parents Donald Fraser and Isabella Munro. Maggie Stewart, Age 23 years; Residence, Kenyon; Place of birth, Canada. Robt. D. Kippen, Age 27 years; Residence Kenyon; Place of birth, Canada. Parents - Duncan Kippen and Anne Sinclair. Christie A. Fraser ,Age 22 years; Residence Kenyon; Place of birth, Canada. Parents - Angus Fraser and Margaret McPhee. Married - Mar. 21, 1882. Witnesses Malcolm McCannel and E. D. McMillan, Kenyon. Duncan McLeod, Age 31 years; Residence Kenyon; Place of birth, Canada. Annie Cameron, Age 21 years; Residence Kenyon; Place of birth, Kenyon. Parents - Rod. Cameron and Mary McLennan. Married June 1, 1882 .Witnesses John McNaughton and M. McLennan, Dunvegan. James McMaster, Age 42 years, Residence Kenyon; Place of birth, Canada. Jessie McLeod, Age 38 years; Residence, Kenyon; Place of birth, Canada. Married - July 25, 1882. Witnesses, John A. McRae and Dugald McMaster, Kenyon. Duncan Fraser Age 26 years; Residence, Kenyon; Place of birth, Canada. Parents - James Fraser and Harriet Grant. Harriet McKay Age 26 years; Residence, Kenyon; Place of birth, Canada. Parents, Angus McKay and Catherine Campbell. Married Apr. 3, 1883. Witnesses - D. D. Kippen and Finlay McKay, Kenyon. William Sproule, Age 28 years; Residence, Caledonia; Place of birth, Canada. Parents - John Sproule and Hannah Finlay. Jane Barr, age 24 years, Residence Caledonia; Place of birth, Scotland. Parents - Alexander Barr and Jane Rowat. Married Oct, 16, 1883. Witnesses - Chas. Sproule, Hawkesbury, and Mary Barr, Caledonia. Angus Patterson, Age 29 years; Residence, Finch; Place of birth, Scotland. Parents - Donald Patterson and Christena McLucas. Margaret McQueen, Age 25 years; Residence, Kenyon; Place of birth, Canada. Married - Dec . 19, 1883 . Witnesses - D. McPherson, Mr. .Heney, Finch. Donald Kippen, Age 27 years ; Residence, Kenyon ; Place of birth, Canada. Jane Ann McKay, Age 22 years; Residence, Kenyon; Place of birth, Canada. Married - Apr. 3, 1883. Witnesses M. P. McCuaig and Duncan Fraser, Dominionville. Hector McDonald, Age 47 years , Residence , Michigan U.S.A. ; Place of birth, Canada. Parents - Donald McDonald and Flora McInnis. Flora Campbell Age 30 years; Residence Kenyon; Place of birth, Canada. Parents - Donald Campbell and Merion McLeod. Married - Jan. 15, 1884 .Witnesses, Chas. McDonald, M. L. Stewart, Kenyon. Parents - Lachlan McIntyre and Ann Cameron at sea - crossing to Canada. Catherine McLennan, Age 24 years, Residence, Kenyon .Place of birth, Canada. Parents - John McLennan and Mary Morrison. Roderick McDonald, Age 27 years; Residence, Kenyon, Place of birth, Scotland. Parents - Lachlan McDonald and Ann McFarlane. Mary Campbell, Age 26 years; Residence, Kenyon ; Place of birth, Canada. Parents - John Campbell and Annie McRae. Married - July 1,1884. Witnesses - John Campbell and George Dey, Kenyon. Parents- William Carpenter and Marianne Gibson. England. Mary McPhee, Age 24 years; Residence, Caledonia; Place of birth, Canada. Parents - John McPhee and Margaret Campbell. Married - Sept. 10, 1884. Witnesses Donald McPhee, Kenyon, Arch'd McRae, Caledonia. Neil D. McLeod, Age 44 years, Residence Caledonia; Place of birth, Canada. Parents - Duncan McLeod and Mary McLeod. Mary McLeod, Age 26 years, Residence Caledonia; Place of birth, Canada. Parents Neil B. McLeod and Christena McCrimmon. Parents - John McPhee and Sarah McDonald. Flora McLeod Age 22 years. Residence Kenyon, Place of birth, Canada. Married Oct. 2, 1884. Witnesses - N. McL. Murray ,Dunvegan and Wm. N. McLeod , Caledonia. Roderick Fraser, Age 38, West Hawkesbury; Place of birth, Canada. Parents - John Fraser and Catherine McPhee. Annie Fraser, Age 29 years; Residence Kenyon; Place of birth Canada. Married Apr. 2, 1885. Witnesses - W. G. Fraser , W. Hawkesbury , Mrs. McLennan, Manse, Dunvegan. Parents - Wm. Jamieson and Elizabeth Anderson. Canada. Margaret McDonald, Age 29 years; Residence Kenyon, Place of birth, Canada. Parents - Charles McDonald and Alexes McDonald. Daniel McGregor, Age 33 yrs; Residence, St.Elmo, Place of birth, Canada. Parents - John McGregor and Christena Kennedy. Lizzie Cameron, Age 28 years, Residence, Roxborough; Place of birth, Canada. Parents Hugh Cameron and Mary McGregor. James Ferguson, Age 32 years; Residence Maxville; Place of birth, Canada. Catherine Sinclair, Age 28 years; Residence, Athol; Place of birth, Canada. Duncan McCrimmon, Age 28 years; Residence Dunvegan; Place of birth, Canada. Flora Cameron, Age 18 years; Residence Kenyon; Place of birth, Canada. Parents - Donald Cameron and Harriet McDonald. Married - July 9, 1885. Witnesses - John H. McRae, Dunvegan, Mrs. McLennan, Dunvegan. John R. Wight, Age 29 years, Residence, Caledonia; Place of birth, Canada. Parents - George P. Wight and Anne Cameron. Catherine McIntosh Age ; Residence Caledonia, Place of birth, Canada. Parents -Dugald McIntosh and Christena McLennan. Married July 14, 1885. Witnesses - Wm. D. McLeod, Caledonia, Rod. M. McDonald, Kenyon. William Dousett, Age 23 yearn; Residence, Maxville; Place of Birth, Canada. Parents - William Dousett and Margaret Leaver. Catherine Ward, Age 17 Residence, Maxville; Place of birth, Canada. Parents - William Ward and Marion Stewart. Married - July 14, 1885. Witnesses, Alex Archibald, Maxville, Sarah Dousett, Plantagenet. Murdoch Stewart, Age 30 years; Residence, Kenyon; Place of birth, Canada. Parents - Norman Stewart and Ann McKercher. Sarah Nicholson, Age 26 years; Residence, Kenyon; Place of birth, Scotland. Parents, Roderick Nicholson and Catherine Lamont. Married - Sept. 30, 1885. Witnesses - Murdoch L. Stewart, Maxville ,Donald Stewart Vankleek Hill. Angus McLennan, Age 30 years; Residence, Kenyon; Place of birth, Canada. Parents, John McLennan and Mary Morrison. Annabel Campbell, Age 26 years; Residence, Kenyon ; Place of birth, Canada. Parents - Donald M. Campbell and Catherine Dewar. Married - Nov. 10, 1885; Witnesses - Jessie McKenzie, Kenyon, Alex McLennan. John Campbell, Age 37 years ; Residence, Kenyon ; Place of birth , Canada. Parents - John Campbell and Ann McRae. Mary Dey, Age 20 years ; Residence, Kenyon ; Place of birth, Canada. Parents - Robert Dey and Catherine McMillan . Married Jan. 20, 1886. Witnesses - George Dey, Kenyon and Donald McPhee, Kenyon. Archibald McCrimmon Age 30 years; Residence Kenyon; Place of birth, Canada. Parents - Donald McCrimmon and Harriet McLeod. Parents - Donald McIntosh and Janet Urquhart. Married Mar. 3, 1886 Witnesses D. D. McLeod, Kenyon and Donald Urquhart, Caledonia. Benjamin McCrimmon, AGE 33 years , Residence, West Hawkesbury; Place of birth, Canada. Parents , Roderick McCrimmon, and Elizabeth McMillan. Sarah McLeod, Age 20 years; Residence Caledonia; Place of birth, Canada. Parents - Wm. D. McLeod and Rachel Cameron. John J. McDonald , Age 35 years; Residence, Kenyon; Place of birth, Canada. Parents - John M Donald and Catherine McLeod. Sarah McDonald, Age 24 years Residence Kenyon; Place of birth , Kenyon. John D. McRae, Age 28 years; Residence Roxboro; Place of birth, Canada. Parents - Duncan McRae and Margaret Fraser. Flora McGillivray, Age 27 years, Residence, Roxboro; Place of birth, Canada. Parents - Kenneth McGillivray and Jessie McKenzie. Married Aug. 12, 1886. Witnesses - Christena McIntosh and Alex McRae, Roxboro. Malcolm D. Carther, Age 25 years, Residence, Maxville; Place of birth, Canada. Parent - John Carther and Christena Gray. Mary Stewart, Age 24 years; Residence, Kenyon; Place of birth, Canada. Married, Oct. 6, 1886 . Witness F. Ross, Maxville , M. L. Stewart, Maxville. Hugh Campbell Age 31 years; Residence, Roxboro; Place of birth, Scotland. Parents, Murdoch Campbell and Flora McGillivray. Harriet McLennan Age Residence, Kenyon; Place of birth, Canada . Parents - Duncan McLennan and Mary Fraser. Married Dec. l, 1886. Witnesses Malcolm Dewar, Kenyon; Malcolm McLennan, Roxboro. Murdoch P. Stewart Age 35 years, Residence, Kenyon; Place of birth, Canada. Parents - Peter Stewart and ,A Ann McRae . Mary C. McRae, Age 26 years ;Residence, Kenyon; Place of birth, Canada. Parents - Angus McKay and Catherine Campbell. Christie Kippen, Age 26 years; Residence, Kenyon; Place of birth, Canada. Parents - Donald Kippen and Sarah Fletcher. Married April 5, 1887. Witnesses John Welsh and Duncan McLean, Kenyon. Rev. Donald MacLeod 1889 - 90. no entries in original records in files I have for these years. Murdoch McRae, Age___ Residence, Kenyon; Place of birth, Kenyon. Nora McLeod Age Residence, Kenyon; Place of birth, Kenyon. Married - June 3, 1891 .Witnesses, Christy Ann McSweyn and Wm. McRae. Wm., D. McLeod, age 35; Residence Kenyon; Place of birth, Kenyon. Parents Donald McLeod and Margaret Fraser. Elizabeth Grant Age 18 r Residence, Kenyon; Place of birth, Kenyon. Parents - John Grant and Harriet Urquhart. Married - Oct. 6, 1891 . Witness Alice McLeod, Kenyon. Norman D .McLeod, Age; Residence Kenyon; Place of birth, Kenyon. Parents - Donald McLeod and Margaret Fraser. Joanna McRae, Residence, Kenyon; Place of birth Kenyon. Parents - Finlay McRae and _____ McLennan. Married Nov. 19, 1891 .Witness, John McLeod, Kenyon. William R. McLeod, Age __, Residence, Kenyon; Place of Birth, Kenyon. Parents - Roderick McLeod and Mary McLennan. Margaret McRae, Age __, Residence, Kenyon; Place of birth, Kenyon. Parents John McRae and Mary McLeod. Married Sept. 1. 1891. Witnesses Mary Bell McRae and Murdoch McRae. Alexander Fraser, Age ___, Residence Athol; Place of birth, Athol. Mary Cassie McRae; Age __ Residence, Kenyon; Place of birth, Kenyon. Donald R. McGillivray, Residence Lochiel; Place of birth, Lochiel. Parents John Chisholm and Sarah Bethune. Married May 17, 1892. Witness. Duncan McGillivray, Lochiel. Charles Alfred Jones, Residence, Kenyon; Place of birth, Kenyon. Margaret Fraser, Residence, Kenyon; Place of birth, Kenyon. Parents John Fraser and Catherine McRae. Duncan McNeil, Residence, Kenyon; Place of birth, Kenyon. Christy Harriet Fraser; Residence, Kenyon; Place of birth, Kenyon. Alexander McLean, Residence, Moose Creek; Place of birth, Moose Creek. Mary Ann McRae; Residence, Kenyon; Place of birth, Kenyon. Parents Donald McRae and Rebecca Cameron. Married Nov. 15, 1892. Witnesses ____ McLean, Moose Creek. Dugald McDonald; Residence, Kenyon; Place of birth, Caledonia. Mary McCrimmon; . Residence, Kenyon; Place.of birth, Kenyon. John Urquhart, Residence. British Columbia; Place of birth, Indian Lands. Rachel McLeod; Residence, Caledonia; Place of birth, Caledonia. Parents Arch McLeod, Christena McIntosh. Married Aug. 29, 1893. Witnesses Donald Urquhart, Skye. Alexander McIntosh, Residence United States; Place of birth Kenyon. Parents Donald McIntosh, Jane Urquhart. Mary McSweyn, Residence, Kenyon; Place of birth, Kenyon. Parents John McSweyn, Isabella McLeod. Duncan N. McLeod, age 28 yrs; Residence, Kenyon; Place of birth, Kenyon. Parents Neil McLeod and Flora McSweyn. Lizzie McKenzie age 18; Residence, Kenyon; Place of birth, Kenyon. Parents Roderick R. McKenzie and Emma McLean. Married Dec. 6, 1893. Witness Angus McLeod, Kenyon. Robert U. S. Campbell; Age ___; Residence, Lagan; Place of birth, Lagan. Parents Donald Campbell and Susan Campbell. Christy M. Chisholm age 23 yrs., Residence, Caledonia; Place of birth Caledonia. Married Mar. 22, 1894. Witness, Chas Northcott, Vankleek Hill. Alexander Calder, age 22 yrs; Residence, Montreal; Place of birth, Lancaster. Parents Alex'r Calder and Jenne McBean. Catherine Campbell, age 18 yrs. ; Residence, Kenyon; Place of birth, Kenyon. Parents Alexander Campbell and Catherine Dewar. Married Apr. 24, 1894. Witnesses, Kenneth McLean, Annie Campbell, Kenyon. Parents - Duncan Morrison and Mar't Isabella McGregor. Parents - Archibald McLeod and Christena McIntosh. Duncan Alex McLennan, Age 34 years; Residence, Kenyon; Place of birth, Kenyon. Parents - Roderick McLennan and Rachel McGillivray. Christena A. McLeod, Age 26 years; Residence, Kenyon; Place of birth, Kenyon. Parents - Roderick McLeod and Catherine McLeod. Married - Oct. 10, 1894. Witnesses Duncan McGillivray and Maggie McLeod, Kenyon. Alda McCuaig, Age 25 years; Residence, Caledonia; Place of birth, Caledonia. Parents - John J. McCuaig and Harriet Stewart. Married - June 27, 1895. Witness - Kenneth McKay, Montreal. John Kippen, Age 29 years, Residence, Kenyon; Place of birth, Kenyon. Parents - Hugh Kippen and Elizabeth McEwen. Jessie Campbell, Age 28 years; Residence Kenyon; Place of birth Kenyon. Parents Alexander Campbell and Isabella Campbell. Married July 15, 1895. Witness Lauchie McDonald, Kenyon. Sarah Margaret McCuaig, Age 19 years; Residence, Kenyon; Place of birth, Kenyon. Parents - Malcolm McCuaig and Isabella McMillan. Married - July 17, 1890. Witness - Angus McLeod , Kenyon. Richard Holmes, Age 34 years; Residence, Montreal; Place of birth , Rawdon, Montcalm. Parents - Philip Holmes and Eliza Alexander. Christy Ann Campbell, Age 18 years; Residence, Kenyon ; Place of birth, Kenyon. Parents - Norman Campbell and Mary Campbell. Married - Aug. 19, 1895. Witness, Kenneth McLean, Skye, Scotland. David R. Wallace, Age 26 years, Residence, Sandringham; Place of birth, New York State. Anna C .Morrison Age 22 Years; Residence, Kenyon; Place of birth, Kenyon. Parents - John Morrison and Mary Cameron . Married Jan 1,1896. Witnesses - Duncan McLeod and Sarah Morrison. Neil McLean, Age 31 years; Residence, Kenyon ; Place of birth, Kenyon. Parents - Neil McLean and Sarah Tolmie. Isabella Campbell, Age; Residence Kenyon; Place of birth, Kenyon. Hector Urquhart, Age 34 years; Residence, Athol, Prescott, Place of birth, Athol, Prescott. Parents - Alexander Urquhart and Catherine McNaughton. Christena McLeod, Age 29 years; Residence, Caledonia; Place of birth, Caledonia. Parents - Neil McLeod and Christena McCrimmon . Married - Nov. 24, 1896. Witnesses - Chas. F. Arkinstall, Plantagenet, Bessie McLeod, Caledonia. Parents - Neil Morrison and Mary McCuaig. Sarah Ann Gray, Age 26 years; Residence, Kenyon; Place of birth, Kenyon. Parents - Angus Gray and Isabella Cameron. John Angus McRae, Age 31 years; Residence, Vankleek Hill, Place of birth, Hawkesbury. Parents - John McRae and Annie Hay. Sarah Fraser Age 20 years; Residence Kenyon; Place of birth, Kenyon. Married June 30, 1897. Witness Katie Mary Fraser, Vankleek Hill John Thomson? Vankleek Hill. Parents - Alex Campbell and Catherine Dewar. Married Sept. 8, 1897; Witnesses Maggie Ann Campbell and Angus Campbell Kenyon. George 0. Harp, Age 67; Residence, Finch; Place of birth, Williamsburg, Ont. Parents - Hiram Harp and Dorothy West. Annie McLeod, Age 38 Years; Residence Kenyon, Place of birth, Kenyon. Parents - Alex Wm. McLeod and Christena McLennan. Married June 23, 1898. Witnesses - Mary McLeod and Mary M. Campbell, Dunvegan. Marriages - Rev. K. A. Gollan. John Alfred Welsh, Age 32 yrs., Residence, Greenfield, Place of birth, Kenyon. Parents , Alfred Welsh, Maggie Campbell. Eliza McLeod, Age 32 yrs., Residence Caledonia, Place of birth, Caledonia. Parents, John D. McLeod and Sarah McInnes. Married Mar. 22, 1898. Witness, A. Cluff, Greenfield. Malcolm McRae, Age 34, Residence, Lochiel, Place of birth, Lochiel. Parents - Rory McRae and Nora Bethune. Sarah Dewar, Age 26 yrs. ; Residence Kenyon; Place of birth, Kenyon. Parents, Farquhar Dewar and Nancy McCuaig..
Married Oct. 10, 1899. Witnesses, Norman McRae, Lochiel, Mary Dewar, Kenyon. Duncan J. McLeod ,Age 31 yrs. ; Residence, Caledonia; Place of birth, Caledonia. Isabella McRae, Age 27 Yrs. ; Residence Kenyon; Place of birth, Kenyon. Parents, John McRae and Mary McLeod. Married, Oct. 18, 1899. Witnesses, Duncan McSweyn, Bella McLeod, Kenyon. Alexander McLean, Age 34 yrs. ; Residence Kenyon; Place of birth, Kenyon. Parents, Angus McLean and Catherine McKercher. Mary Ann McCrimmon, Age 2 ? ; Residence Kenyon; Place of birth, Kenyon. Parents, Neil McCrimmon and Ann McMillan. Married Mar. 15, 1900. Witnesses - Neil McLean, 9th Kenyon, Christena McCrimmon ,9th Kenyon. Donald Angus Murray, Age 23 yrs. 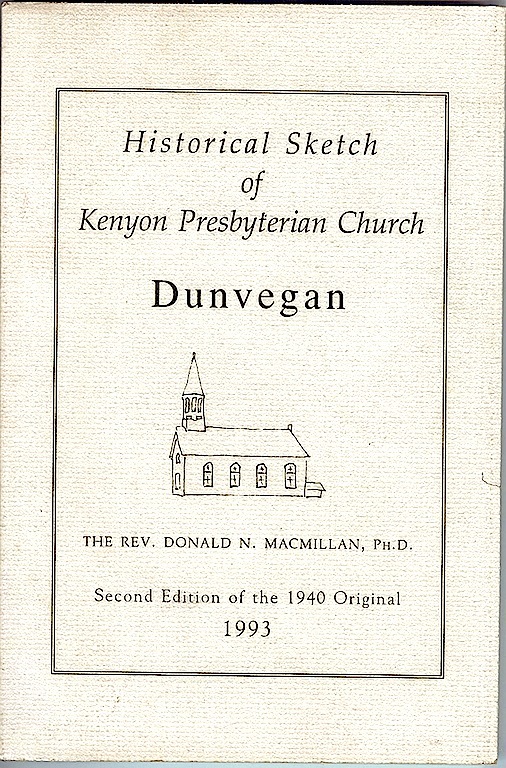 ; Residence Dunvegan; Place of birth, Kenyon. Parents, Norman Murray and Catherine Gleason. Etta Smith, Age 21 yrs., Residence, Dunvegan; Place of birth , Walkerton. Parents, D. F. Smith and M. D.. and Alexina McQueen. Witnesses - Marion McLeod, Alexandria, Angus Sproule, Maxville, Ont. Chas. F. Arkinstall, Age 27 yrs. ; Residence, Plantagenet, Place of birth, Liverpool, Eng. Parents, Wm. Arkinstall, and Catherine Campbell. Bella Jane Fraser, Age 2 ?, Residence, Kenyon; Place of birth, Kenyon. Parents, W. D. Fraser and Annie Stewart. Married June 6, 1900, Witness, Duncan Kennedy, Dunvegan, Ont. James A. Cluff, Age 35 yrs. ; Residence, Kenyon; Place of birth, Lagaerra , Que. Parents, Elder Cluff and Eliza Kerr. Mary E. Edwards, Age 2 4 yrs. ; Residence Kenyon; Place of birth, Montreal. Married June 6, 1900. Witnesses, Mary McCuaig, Ottawa, Dan Kippen, Kenyon. Parents, Angus McKay and Jessie McKay. Annie McCuaig Age 32 yrs; Residence, Caledonia; Place of birth, Caledonia. Married June 27, 1900. Witnesses- Caroline McCuaig, Caledonia, John Murray, Montreal . Parents Neil McCrimmon and Ann McMillan. Kenyon. Flora L. Morrison, Age 26 yrs., Residence Kenyon, Place of birth, Kenyon. Parents, Duncan Morrison and Jane Urquhart. Married July 24, 1900 Witnesses Duncan McNeil, Sarah Morrison, Kenyon. Parents - Angus McLeod and Isabella McKenzie. Flora McKenzie, Age ; Residence Kenyon, Place of birth, Kenyon. Parents - John McKenzie and Sarah McRae. Witnesses, Allie McKenzie, Skye P.O. , Ewen McLeod, Dunvegan. Donald K. MacLeod, Age 36 yrs. ; Residence, Kenyon; Place of birth, Kenyon. Parents - Kenneth McLeod and Rebecca McLeod. Mary A. Dewar, Age 25 yrs., Residence, Kenyon, Place of birth, Kenyon. Parents - Rory McLennan and Rachel McGillivray. Kenyon. Parents - Don'd Urquhart and Catherine Douglas. Married Jan. 29, 1901. Witnesses Annie F. McMaster, Laggan , Dan McNaughton, Devil's Lake. Malcolm Campbell, Age 31 yrs. ; Residence , Kenyon; Place of birth, Kenyon. Parents , Donald Campbell and Christena Dewar. Flora McRae, Age 26 yrs. ; Residence, Kenyon; Place of birth, Kenyon. Parents, Donald McRae and Rebecca Cameron. Married - Feb. 26, 1901. Witnesses - Jemima McRae, Andrew Fraser - Dunvegan. Parents - Rory Cameron and Annie McCrimmon. Jessie E. Chisholm, Age 24 yrs., Residence, Kenyon, Place of birth, Kenyon. Parents, Donald Chisholm, Bella McLeod. Parents, Lewis McCaskill and Mary McGillivray. Margaret McMillan, Age ? Residence, Kenyon; Place of birth, Kenyon. Parents, Alex McMillan and Ann McIntosh. Married July 17, 1901. Witnesses, Agnes Gollan, Annie McCuaig, Dunvegan. James Montgomery, Age 28, Residence, Kenyon; Place of birth, Muskoka . Parents John Montgomery and Margaret Crawford. Margaret McLennan, Age ? Residence, Kenyon; Place of birth, Kenyon. Parents, Duncan B. McLennan and Mary Fraser. Married July 31, 1901. Witnesses, Annie McMillan, Chas. Montgomery, Dunvegan. John E. Taylor, Age 26 yrs. ; Residence, Montreal; Place of birth, Berthier , Que. Parents, John Taylor and Mary Leith. Isabella Cameron, Age 20, Residence, Caledonia; Place of birth, Caledonia. Married July 9, 1901. Witnesses - Mary Cameron and John Cameron - Caledonia. John McLeod, Age 30 yrs. ; Residence Kenyon; Place of birth, Kenyon . Bella M. Fraser, Age 19 yrs. ; Residence Kenyon , Place of birth, Kenyon. Parents - Rory Fraser and Margaret Stewart. Witnesses - Maggie Fraser, Dunvegan, John D. Grant, Laggan. Peter McNaughton, Age 26 yrs. ; Residence, Lochiel; Place of birth, Lochiel. Parents Donald McNaughton and Isabella Cameron. Rebecca McLeod, Age 26 yrs. ; Residence, Kenyon; Place of birth, Kenyon. Parents, Rory McLeod and Catherine McLeod. Married Oct. 29, 1901. Witnesses, Maggie McCrimmon, McCrimmon, George Cameron, Lochiel. Duncan D. McSweyn Age 30 yrs. ; Residence, Kenyon; Place of birth, Kenyon. Parents, John McSweyn and Isabella McLeod. Christie Grant, Age 23 yrs. ; Residence Kenyon; Place of birth, Kenyon. Parents, John Grant and Harriet Urquhart. Married Nov. 20, 1901. Witnesses, Sarah Grant, Donald McMillan, Laggan. Charles Stewart, Age 32 yrs. ; Residence, Kenyon; Place of birth, Kenyon. Parents, Angus Stewart and Barbara McLean. Katie M. McCuaig, Age 31 yrs. ; Residence Kenyon; Place of birth, Kenyon. Parents, John McCuaig and Bella McLeod. Married Nov. 20, 1901. Witnesses, Mary McCuaig, Duncan McCuaig, Dunvegan. John R. B. McPhee, Age 26 yrs. ; Residence, Kenyon, Place of birth, Kenyon. Parents, Donald McPhee and Flora McGillivray. Annie McDonald, Age 26 yrs. ; Residence, Kenyon; Place of birth, Kenyon. Parents- Ewen McDonald and Fanny McPhee. Angus Bradley, Age 32 yrs. ; Residence Caledonia; Place of birth , Caledonia. Parents, James Bradley and Isabel Cameron. Catherine Morrison, Age 28 yrs. ; Residence, Kenyon; Place of birth, Kenyon. Parents, John Morrison and Mary Cameron. Married Apr. 29, 1902. Witnesses Flora Bradley and Philip Proudfoot, Caledonia. Robert Grant, Age 40 yrs. ; Residence, Kenyon; Place of birth 7th Kenyon. Parents, James Grant and Christie McNaughton. Annabella McCuaig, Age 25 yrs. ; Residence Kenyon, Place of birth, Kenyon. Married June 5, 1902 Witness - Mary Alice McCuaig, Dunvegan. Archibald McLeod, Age 46, Residence 9th Kenyon; Place of birth 9th Kenyon. Parents - Donald McLeod and Maggie Fraser. Christie Fraser, Age 38 yrs. Residence, 8th Kenyon; Place of birth 8th Kenyon. Parents, John Fraser and Catherine McRae. Peter McLean, Age 33 yrs. Residence 9th Kenyon; Place of birth, 6th Kenyon. Parents- Malcolm McLean and Mary McCrimmon. Nora Chisholm, Age 27 yrs, Residence 9th Kenyon; Place of birth, 9th Kenyon. Married June 25, 1902. Witnesses- Agnes Gollan and Mary A. McCuaig. Duncan Kennedy, Age 29 yrs. ; Residence 8th Kenyon; Place of birth, 8th Kenyon. Parents - Donald Kennedy and Ann McDougall. Parents Chas. Stewart and Isabella McCuaig. Parents Donald Urquhart and Katie Douglas. Married Oct. 14, 1902. Witnesses Agnes &Gollan, Annie M. Campbell. Parents - Angus McLeod and Ann Kennedy. Parents - John McLeod and Sarah McInnes. Married - Oct. 28, 1902. Witnesses, J. Welsh and Mary McLeod. John N. McLean, Age 37 yrs; Residence Roxboro; Place of birth Roxboro. Parents - Roderick McLean and Catherine Stewart. Parents John McCuaig and Harriet Stewart. Married Dec. 2, 1902. Witnesses Dan McLean, Moose Creek, Finny McCuaig, Caledonia. Daniel W. Fraser, Age 26 yrs. ; Residence Southfield, Ohio; Place of birth, Kenyon. Parents - Wm. D. Fraser and Annie Stewart. Margaret McLennan, Age 19 yrs. ; Residence, Kenyon; Place of birth, Kenyon. Parents - Kenneth McLennan and Christy Grant. Married Dec. 30, 1902. Witnesses Jas. R. McLennan, Mary Ann Fraser, Dunvegan. Duncan McRae, Age 42 yrs. ; Residence 7th Kenyon; Place of birth, 7th Kenyon. Parents - Kenneth McRae and Christy McLeod. Married Mar. 4, 1903. Witnesses Sarah McDonald, John McDonald, 9th Kenyon. John Stevens, Age 28 yrs. ; Residence West Hawkesbury ; Place of birth, West Hawkesbury. Parents - Martin Stevens and Lizzie Eaton. Parents - Donald Bethune and Christy Bethune. Parents - Wm. McCosham and Christena McLennan. Margaret Morrison, Age 32 yrs. ; Residence Peveril , Que. ; Place birth, Peveril, Que. Parents John H. Morrison and Sarah McCosham . Married July 1, 1903. Witnesses Joanna McLeod, Geo. Fleming, Dunvegan. Thos. A. McLeod, Age 26 yrs. ; Residence Caledonia; Place of birth, Caledonia. Bessie A. Roscoe, Age 25 yrs. ; Residence Kenyon; Place of birth, Kenyon. Parents Byron Roscoe and Annie Campbell. Married July 7, 1903. Witnesses-Flora McLeod, Dan McLeod, Caledonia. Duncan K. McLeod, Age 33 yrs. ; Residence Dunvegan; Place of birth, Kenyon. Parents- Kenneth McLeod and Rebecca McLeod. Mary Ann Dewar, Age 27 yrs; Residence &8th Kenyon; Place of birth, 8th Kenyon. Married Sept. 16, 1903. Witnesses Norman McLeod, Duncan R. McLeod, Dunvegan. Alexander McDonald, age 26 yrs. ; Residence 6th Kenyon; Place of birth, Charlottenburgh. Parents Duncan McDonald and Sarah McDonald. Bella Campbell, age 23 yrs. ; Residence, 7th Kenyon; Place place of birth, Argenteuil, Que. Parents Norman Campbell and Mary Campbell. Married Oct. 8, 1903. Witnesses, Flora Cameron, Maxville; Allan McLennan, Fassifern. Roderick Wm. McLeod, Age 30 yrs. Residence, 9th Caledonia; Place of birth 9th Caledonia. Parents Donald R. McLeod, Mary McDonald. Maggie McCrimmon, Age 28 yrs,; Residence 8th Caledonia; Place of birth 8th Caledonia. Parents John McCrimmon and Penelope McLeod. Married Nov. 3, 1903. Witnesses Penelope McCrimmon, Dan McCrimmon, 8th Caledonia. John J. Campbell, Age 45 yrs. ; Residence 9th Kenyon; Place of birth 9th Kenyon. Parents John Campbell and Ann McRae. Maggie Carpenter, Age 18 yrs. ; Residence Caledonia; Place of birth Caledonia. Parents Jesse Carpenter and Mary McPhee. Married Dec. 17, 1903, Witnesses Agnes Gollan, ______ McKenzie, Dunvegan. Parents Henry Franklin and Eliza Muir. Annabella Stewart, Age 27 yrs. Residence, 9th Kenyon; Place of birth 9th Kenyon. Parents Murdoch A. Stewart and Maggie Campbell. Married Jan. 20, 1904. Witnesses Mary A, Stewart, John A. Stewart, Dunvegan. John Campbell, Age 38 yrs, Residence 8th Kenyon, Place of birth 8th Kenyon. Annie Dewar, Age 24 yrs. ; Residence 8th Kenyon; Place of birth 8th Kenyon. Parents Malcolm Dewar and Harriet Fraser. Married Mar. 15, 1904. Witnesses Jessie Dewar, Dunvegan, Kenneth Dewar, Moose Creek. John A. McLeod, Age 28 yrs,; Residence 7th Kenyon, Place of birth Caledonia. Parents John McLeod and Kate Nixon. Parents Angus Cameron and Mary Chisholm. Married Mar.1, 1904. Witnesses Agnes Gollan, Willie Chisholm, Dunvegan. Roderick D. McDonald, Age 47,; Residence, 8th Kenyon; Place of birth, 9th Kenyon. Parents Donald McDonald and Flora Urquhart. Flora McRae, age 40 yrs. ; Residence 7th Kenyon; Place of birth, Kenyon. Parents Kenneth McRae and Christy McLeod. Married Mar. 16, 1904. Witnesses, D. McRae, Mrs. M. Fraser, 7th Kenyon. Kenneth A. McKenzie, Age 25 yrs. ; Residence 9th Kenyon; Place of birth, 9th Kenyon. Parents John McKenzie and Sarah McRae. Flora E. McKenzie, Age 19 yrs. ; Residence 8th Kenyon; Place of birth 8th Kenyon. Parents Wm. McKenzie and Annie Cameron. Married Mar. 23, 1904. Witnesses, Bessie Grant, Wm. McKenzie, Dunvegan. John D. Gilles, Age 30 yrs. Residence Montreal; Place of birth, Kenyon. Parents Donald Gilles and Ann Cameron. Mary C. Clark, Age 27 yrs. Residence 9th Kenyon; Place of birth, 9th Kenyon. Parents Wm. Clark and Catherine McMillan. Married June 22, 1904. Witnesses, Christy McMillan, Dunvegan, Wm. McNaught, Montreal. Harry R. Mountney, Age 24 yrs. ; Residence Montreal; Place of birth Providence R.
Parents Henry G. Mountney and Lilly A. Barnes. Annie McMillan, Age 24 yrs. ; Residence Dunvegan; Place of birth Dunvegan. Parents Donald McMillan and Annie McCannel. Married Nov. 19, 1904. Witnesses, Christy McMillan, Don Campbell, Dunvegan. David R. Urquhart, Age 37.; Residence Apple Hill; Place of birth, Moose Creek. Parents John Urquhart and Mary Morrison. Katie McLeod, Age 32 yrs. ; Residence 9th Kenyon; Place of birth, 9th Kenyon. Parents Donald McLeod and Sarah McRae. Married Nov. 22, 1904. Witnesses Nora McLeod, 9th Kenyon, Ken Urquhart, Vankleek Hill. John Boclair, Age 40 yrs. ; Residence Kenyon; Place of birth, St. Jerome, Que. Parents Baptiste Boclair and _______ . Lizzie Deroucher, Age 28 yrs. ; Residence 9th Roxboro; Place of birth, Riceville. Parents Edward Deroucher and Eliz. Julian. Married Jan. 31, 1905. Witnesses D. F. McCrimmon, Ed. Deroucher, Sandringham. Norman McLeod, Age 42, Residence 22 8th Kenyon; Place of birth 9th Kenyon. Christy McKinnon, Age 35.; Residence 18 9th Kenyon, Place of birth 9th Kenyon. Parents Donald McKinnon and Christy McLean. Married Mar. 22, 1905. Witnesses, Agnes Gollan, Hattie Morrison, Dunvegan. Albert E. Barrett Age 27 yrs. ; Residence, 21 Indian Lands. Place of birth, South Plantagenet. Parents John Barrett and Louisa Gates. Annie Dey Age 27 yrs. ; Residence 31 9th Kenyon, Place of birth, 31 9th Kenyon. Married June 7, 1905. Witnesses Nellie Dey 31 9th Kenyon, Dan Chisholm 17 9th Kenyon. Donald E. Hartrick, age 31 yrs. ; Residence 13 7th Kenyon; Place of birth, Hull, Que. Parents Peter Hartrick and Catherine McLeod. Flora Cameron, Age 27 yrs. ; Residence 10 Caledonia; Place of birth 10th Caledonia. Parents Rory Cameron and Annie McCrimmon. Married June 7, 1905. Witnesses Mandy Cameron, Alex N. McLeod, Dunvegan. Parents Archy Clark and Sarah Fraser. Flora McKenzie, age 27 yrs. Residence, 9th Lochiel; Place of birth, Montreal. Parents John McKenzie and Sarah Morrison. Married June 28, 1905. Witnesses, John McCrimmon, Helen McCrimmon, McCrimmon. Murdoch Clark, Age 32 yrs. ; Residence 34 9th Kenyon; Place of birth Kenyon. Parents William Clark and Catherine McMillan. Joanna McLeod, Age 24 yrs. ; Residence 27 8th Kenyon; Place of birth 27 8th Kenyon. Parents Donald O. McLeod and Catherine McCaskill. Married Nov. 1st, 1905. Witnesses Sarah Chisholm, Rory K. McLeod, Dunvegan. Hugh A. McIntosh, Age 25 yrs. Residence Gapview, Sask. ; Place of birth Caledonia. Parents John A. McIntosh and Ann McCrimmon. Christena Campbell, Age 24 yrs. ; Residence 21 9th Kenyon; Place of birth 21 9th Kenyon. Parents John Campbell, Jessie Boyd. Married Feb. 21, 1906. Witnesses Christy Grant, Laggan. Ken N. McIntosh, Skye. Duncan R. McLeod, Age 34 yrs. ; Residence 18 9 Kenyon. Place of birth 18 9 Kenyon. Parents Roderick McLeod and Catherine McLeod. Mary Alice McCuaig, Age 20 yrs. ; Residence 15 7th Kenyon. Place of birth, 15 7th Kenyon. Parents Malcolm McCuaig and Bella McMillan. Married Mar. 28, 1906. Witnesses Maggie McCuaig, Norman McLeod, Dunvegan. Farquhar McLeod, Age 32 yrs. ; Residence 26 8th Kenyon. Place of birth, 29 8th Kenyon. Parents Kenneth McLeod and Rebecca McLeod. Belle McLeod, Age 23 yrs. ; Residence 25 9 Kenyon; Place of birth, 25 9 Kenyon. Parents Alex N. McLeod and Flora McDonald. Married Apr. 4, 1906. Witnesses, Christy A. McCrimmon, Kenneth McLeod, Dunvegan. Alex Fraser, Age 28 yrs. ; Residence 14 8th Kenyon. Place of birth 14 8th Kenyon. Parents Wm. D. Fraser and Ann Stewart. Christy Stewart, Age 22 yrs. ; Residence 35 9th Kenyon, Place of birth 35 9th Kenyon. Parents Murdo Stewart and Maggie Campbell..
Married June 5, 1906. Witnesses Alex D. Stewart, Mary A. Stewart, Dunvegan. Kenneth R. Hartrick, Age 30 yrs. ; Residence 29 9 Kenyon; Place of birth, Hull, Que. Sarah Cameron, Age 24 yrs. ; Residence 14 10th Caledonia, Place of birth 14 10 Caledonia. Married July 10, 1906. Witnesses Jessie R. McLeod, Angus D. Cameron, Dunvegan. Angus McRae, age 25 yrs. ; Residence 32 9 Kenyon; Place of birth 32 9th Kenyon. Cassie V. Fraser, Age 19, Residence 16 8 Kenyon; Place of birth 16 8th Kenyon. Parents William Fraser and Annie McRae. Married July 18, 1906. Witnesses Annie Fraser, Dunvegan, John A. Cameron, St. Elmo. George C. Palmer, Age 27 yrs. ; Residence Montreal South; Place of birth England. Parents Thos Palmer and Ann Cox. Florence A. Edwards, Age 22 yrs. ; Residence Greenfield; Place of birth, Montreal. Parents Edward Edwards and Christy McLean. Married Sept. 12, 1906. Witnesses Alda Palmer, Harry Palmer, Montreal South. George Austin, Age 29 yrs. ; Residence Dunvegan, Place of birth, Ottawa. Parents John Austin and Celena Sloan. Sarah M. A. McRae, Age 27 yrs,; Residence 16 10th Caledonia, Place of birth 16 10th Caledonia. Parents Arch'd McRae and Christy McLennan. Married Dec. 26, 1906. Witnesses Jessie McLeod, Wm. Cameron, Dunvegan. Neil McDonald, Age 30 yrs. ; Residence 15 9th Kenyon; Place of birth 15 9th Kenyon. Parents Ewen McDonald and Fanny McPhee. Allie McKenzie, Age 24 yrs. ; Residence, 22 9th Kenyon; Place of birth, 22 9th Kenyon. Parents Roderick McKenzie and Emma McLean. Married July 9, 1907. Witnesses, Bella McKenzie, Skye; Donald Campbell, Dunvegan. Norman R. McLeod Age 30 yrs.' Residence 19 9th Kenyon; Place of birth 19 9th Kenyon. Maggie Fraser, Age 24 yrs. ; Residence 15 8th Kenyon; Place of birth 15 8th Kenyon. Parents Alex Fraser and Christena McDougall. Donald J. McDonald, Age 30 yrs. ; Residence Stoughton, Sask. Place of birth, Harris, Scotland. Parents John McDonald and Christy McLeod. Eliza Bell McLeod, Age 29 yrs. ; Residence 14 9th Kenyon; Place of birth 14 9th Kenyon. Parents Angus McLeod and Isabella McKenzie. Married Jan. 14, 1908. Witnesses Angus McLeod, Helen McLeod, Skye. John M. Campbell, Age 34 yrs. ; Residence Lochiel; Place of birth, Lochiel. Parents John R. Campbell and Catherine Mode. Jessie Chisholm, Age 24 yrs. ; Residence 17 9th Kenyon; Place of birth 17 9th Kenyon. Parents John Chisholm and Maggie McRae. Married July 1, 1908. Witnesses W. A. McKenzie, Vankleek Hill, Sarah Chisholm, Skye. David Beattie, Age 36 yrs. ; Residence, Forget, Sask. ; Place of birth, Aberdeen. Parents George Beattie and Mary Rodick. Parents John Ronald and Marian Baker. Married Dec. 23.1908. Witnesses R. Ronald, Forget, Sask. ; Mabel Bowman, Osgoode, Ont. Hugh McMillan, Age 38 yrs. ; Residence McCormick; Place of birth, Lochiel. Parents Angus McMillan and Ann McMillan. Christy S. McSweyn Age 36 yrs,; Residence 11 9th Kenyon; Place of birth 11 9th Kenyon. Parents John McSweyn and Isabella McLeod. Married Mar. 16. 1909, Witnesses Sarah J. McMillan, Lochiel; D. D. McSweyn, Dunvegan. Albert underwood, Age 27 yrs. ; Residence, Montreal; Place of birth, England. Parents Albert Underwood and Ann Jones. Normanda Murray, Age 25 yrs; Residence, Dunvegan; Place of birth, Dunvegan. Parents Norman McL. Murray and Catherine Gleason. Married July 1, 1909. Witnesses Rachel McLeod, Skye; Albert U. Hardwick, Montreal. William Welsh McLennan, Age 25 yrs. ; Residence Nelson, B.C. ; Place of birth, Laggan. Parents Wm. Welsh and Annie McLennan. Christy Stewart, Age 20 yrs. ; Residence 36 9th Kenyon; Place of birth, 36 9th Kenyon. Parents Donald Stewart and Jane McKinnon. Married July 14, 1909. Witnesses Flossie Stewart, Dunvegan. Henry Evans Clement, Age 31 yrs. ; Residence, Montreal; Place of birth, England. Parents ____ ____ and Sarah Evans. Hannah Blyth, Age 27 yrs. ; Residence, 31 8th Kenyon; Place of birth, 31 8th Kenyon. Parents David Blyth and Catherine McMillan. Married June 15, 1910, Witnesses Maggie Blyth, Willie Blyth, Dunvegan. Duncan McGillivray, Age 54 yrs. ; residence Kenyon; Place of birth, Kenyon. Parents Malcolm McGillivray and Janet McLeod. Annie McKay, Age 42; Residence Caledonia; Place of birth, Caledonia. Parents John McCuaig?? and Harriet Stewart. Married Jan 30, 1910. Witnesses Cassie McGillivray, D. K. McLeod, Dunvegan. Kenneth W. McRae, Age 27 yrs. Residence, 32 9th Kenyon; Place of birth 32 9th Kenyon. Sarah Campbell, Age 22 yrs. ; Residence 26 7 Kenyon; Place of birth 26 7th Kenyon. Parents Alexander Campbell and Sarah Chisholm. Married Aug. 3rd, 1910. Witnesses Flora Campbell, Dan N. Campbell, Dunvegan. Alex J. McDonald, Age 47 yrs. ; Residence, Dunvegan; Place of birth, Dunvegan. Parents John McDonald and Dorothy Gillis. Flora McCuaig, Age 36 yrs,; Residence, Dunvegan; Place of birth, Dunvegan. Parents John McCuaig and Bella McLeod. Married May 28, 1912. Witnesses John Ross, Bethia Ross, Dunvegan. Roderick McLeod, Age 27 yrs. ; Residence, Skye; Place of birth, Skye. Parents Wm. D. McLeod and Sarah Cameron. Winnifred McQueen, Age 18 yrs. ; Residence, Skye; Place of birth, Skye. Parents Kenneth McQueen and Mary McDonald. Married June 5, 1913. Witnesses Hugh McQueen, Tena McLeod, Skye. Neil B. McLeod, Age 24 yrs. ; Residence, Skye; Place of birth, Skye. Jessie McCuaig, Age 20, Residence Kenyon; Place of birth, Kenyon. Married June 12, 1912. Witnesses Jas. Urquhart, Flora McCuaig, Dunvegan. Robert B. Clarke, Age 29 yrs. ; Residence, Montreal; Place of birth, Brookline, Mass. Parents Robert Clarke and Mary M. Clarke. Marjorie A. McDonald, Age ___ Residence, Alexandria; Place of birth, Alexandria. Parents Ronald M. McDonald and Mary McPhee. Married June 19, 1912. Witnesses Duncan McPhee, Maggie McDonald, Alexandria. Ewen A, McMillan, Age 29 yrs. ; Residence Laggan; Place of birth, Laggan. Parents Dougald McMillan and Mary McMillan. Annie Mary McDonald, Age 26 yrs. ; Residence Kenyon; Place of birth, Kenyon. Parents Dougald McDonald and Johanna Buchanan. Married July 20, 1912. Witnesses John N. McLeod, Cassie McDonald, Dunvegan. Neil M. McCuaig, Age 29 yrs. ; Residence Kenyon; Place of birth, Kenyon. Sarah Chisholm, Age __ Residence Skye, Place of birth, Skye. Married July 3, 1912. Witnesses D. D. McCuaig, Eliza McKinnon, Skye. Alex Wm. McLeod, Age 21 yrs. ; Residence McCrimmon; Place of birth McCrimmon. Tena B. McLeod, Age 20 Residence Skye; Place of birth, Skye. Parents- Wm. D. McLeod and Sarah Cameron. Married ____ ___- 1912. Witness, D. M. McGillivray, Rita McLeod, Skye. Anna Cameron, Dominionville. Harry Crane, Age 29 yrs. ; Residence Montreal; Place of birth Liverpool, England. Parents - Harry Crane and Mary Jones. Mrs. H. R. Montenay Age ___ Residence, Dunvegan; Place of birth Dunvegan. Parents - Donald McMillan and Annie McCannel. Married Oct. 15, 1912. Witness - Mrs. R. Bickerstaff, Montreal. Alex J. Campbell, Age 22 yrs. ; Residence, Dunvegan; Place of birth, Dunvegan. Parents - John Campbell and Mary Dey. Sarah A. McKenzie, Age ---- Residence Dunvegan; Place of birth Dunvegan. Parents - William McKenzie and Annie McLeod. Married Nov. 5, 1912. Witnesses - Libbie McKenzie, J. A. Stewart, Dunvegan. John Gray, Age 38 yrs. ; Residence Kenyon; Place of birth, Kenyon. Parents -Angus Gray and Bella Cameron. Mary M. McLeod Age ----- Residence Dunvegan; Place of birth, Dunvegan. Parents -Alex McLeod and Flora McDonald. Married Dec. 8, 1912. Witnesses Dan McLeod and Mabel McRae. Alex C. Stewart, Age 21 Residence Stewarts' Glen; Place of birth, Stewarts' Glen. Parents Murdoch W. Stewart and Annie Grant. Margaret Urquhart Age ---- Residence, Skye; Place of birth, Skye. Parents - Donald Urquhart and Katie M. Douglas. Married Mar. 4, 1913. Witnesses, Jimmie Urquhart and Flossie Stewart. end of marriage records in this file. Sept.15.98 awf.